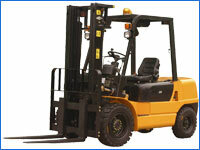 Kent Forklift Training deliver professional accredited training in the safe operation and driving of Forklift Trucks, Access Platforms (Cherry-Picker, Scissor Lifts), Telescopic Handlers, Lorry Mounted Cranes (HAIB) and many other pieces of load moving machinery commonly found in warehouse and industrial environments for example Side loaders and Pivot Steer trucks. We also deliver training in more specialist required areas such as Tow Tractors, Mobile Lighting Units and Vehicle Banksman training. As well as operator training we are also 1 of 90 training organisations in the UK accredited by the RTITB to deliver Instructor Training at our training centre. These courses are ideal for employers requiring the need for an in-house instructor or for those who wish to add to their list of skills in order to work as a lift truck instructor.